The UN World Food Programme (WFP) in accord with the members of the Logistics Cluster has initiated humanitarian flights to Ebola-affected African countries. The first transport from Cologne-Bonn airport was conducted last Wednesday, with a second cargo flight following this week. And more are to come, announces World Food Programme Logistics Officer Sherif Georges. The project was kicked-off last week when a Boeing 747-400 freighter operated by Slovakian Air Cargo Global delivered 100 tons of relief supplies from Cologne to Monrovia, the Liberian capital. Since then, urgently needed materials to prevent the further spread of the Ebola disease has arrived at CGN and will be flown out during this week. Chartering the Boeing 747F is the United Nations WFP agency leading the Logistics Cluster, a group of humnanitarian organizations, working together to ensure a coordinated and effective logistics response in large-scale emergencies. 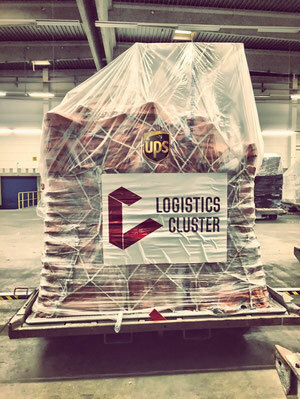 UPS, in partnership with logistics comanies Maersk and Agility, is supporting the Logistics Cluster according to well established guidelines and practices tested during natural disasters. Why did the cluster members in consultation with WFP opt for Cologne-Bonn airport as platform for consolidating the goods? Sherif Georges assures that it could have been other places as well that are in the geographical proximity, such as Amsterdam, Brussels or Liege, for instance. But “Cologne’s big advantage is a free of charge staging area to store and handle the materials. In addition, CGN is the European hub of UPS, which proves to be of great help for this particular project,” Sherif explains. UPS with its large fleet of courier vehicles is actively supporting the project by helping to feed the goods into CGN. In addition, the UPS Foundation provides funds to the amount of $250,000 to finance the necessary overland transports of the materials to the storage facility. “UPS is pleased that this public-private partnership is filling a vital need for global transportation services to Ebola-affected counties by providing free staging storage and consolidation services to the Global Logistics Cluster, to support the humanitarian charter flights to West Africa," said Al Bedran, UPS Europe Region Transportation Manager. He further announces: "From the CGN hub, more relief supplies will be transported to the crisis-hit region in order to provide the dedicated helpers with urgently needed materials."